Home Computer Graphics FastART – Back by Popular Demand. Great Artwork – Cheap! FastART Volumes 1 – 29. Re-Released! Click on image to see full PDF Index. FastART was first introduced in 2002 as a way to help users of our popular Photoshop color separation program, FastFilms, have decent artwork they could use. The first couple of volumes were from a variety of artists. Future volumes were added over the years and were done by our good friends, Spider, and Dave Moore. Both were seasoned T-Shirt artists and they both had a wealth of artwork in their “archives”. Spider passed away in 2009 and Dave is retired and off the grid touring the country. In 2009 with the closing of U.S. Screen Print and the passing of Spider we stopped selling FastART. Times have now changed and cartoon type artwork is more popular again so we have decided to re-introduce FastART. And, this is a way of keeping Spider’s legacy alive. Over 7 gigabytes of artwork! 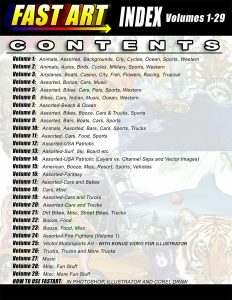 2500 artwork components from cars, to trucks, to sports, to humorous and all topics in between. Introductory Price $99 for the entire collection (reg. $199). Order from our STORE HERE. This artwork is almost entirely raster based artwork that will work in any program. It is NOT vectorized – although it can converted to vectors using simple online services like VectorMagic.com. Each piece of artwork is a standard Photoshop PSD file with the various components in Layers. If you look at the thumbnail images downloadable PDF FastART Index* you will see that there could be three or four very usable components to each file. These components can be building blocks. You can take a background from one and put a car from another in front of it and you are ready to color separate or print to your DTG or Sublimation printer, or use in your online marketing. Check out the short tutorials at the back of this Index to see how to use FastART. Great for Color Separations or DTG! FastART is great if you have a color separation program like T-Seps or if you do your own manual separations. It is great if you print to a direct-to-garment printer or sublimation. Simply show the customer the Index of all the images. Open the file you need. Add text and other elements. Done! Easy! FastART is not sold but licensed for use on T-Shirts, promotiional products, in advertising and more. There are certain license restrictions that apply and the use of FastART signifies you agree to the Licensing Terms and Conditions that are part of the download. In a nutshell you can use the images but you can’t re-sell them as a collection or group of artwork (like clipart) and you can’t copyright them. If you do copyright an image where one of the FastART pieces are a component – the copyright won’t apply to the FastART image. All images in this collection are copyright 2002-2018 Scott Fresener. Important Note: This is a huge collection of files and it is too large to automate the downloading. We have broken the file into three files that are around 2.5 gb each. Once you place an order we will email you download links within 24 hours. * Open and save a PDF of the Complete Index with thumbnails of each image HERE. This is a large file and it could take a minute or more to open. Here are samples of what the PSD Photoshop files look like. Each file has multiple components on individual layers.